What does one do when first diagnosed with cancer? 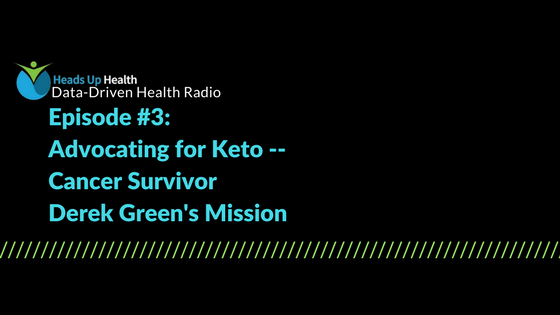 Learn why Derek Green is advocating for keto. After his cancer diagnosis, Derek Green, sought answers as he waited six grueling weeks to be seen by his surgeon. Like a detective, he found resource after resource until eventually discovering low-carb, keto, and fasting. When these powerful dietary tools were added to conventional treatment, he was delighted to discover he was cancer-free. Now Derek’s on a mission to help people newly diagnosed with cancer find resources and options to learn more about metabolic therapies in cancer treatments, and why he’s advocating for keto. Because anyone could go to Google, with all the confusion out there, and land on the wrong person, Derek wants to empower people by connecting them with primary research and options into a digestible form. A self-described data junkie, Derek used his glucometer for biofeedback as he tracked his ketones, fasting glucose, and glucose ketones index (GKI). He also collected data on macros, isolated foods with anti-cancer properties that were also low-carb, and built a diet around that. With his forthcoming website, he wants to help others newly diagnosed with cancer navigate the confusion that comes with knowing what to eat. We’re excited to chat with Derek Green, who was generous enough to share so much wisdom around everything he learned during his battle with cancer, and his plans to empower people with cancer to optimize their health. Derek Green can be found on Twitter and Facebook. Stay tuned for his forthcoming website! Tripping Over the Truth: How the Metabolic Theory of Cancer is Overturning One of Medicine’s Most Entrenched Paradigms by Travis Christofferson, M.S.